Greetings from Nepal…wish you were here! Photo taken on the outskirts of Kathmandu, Nepal in November 2010..
During our almost three week visit to Nepal we saw several of these colorful, crazy Nepalese buses. It almost seemed like some sort of odd competition to figure out who could decorate their buses crazier. 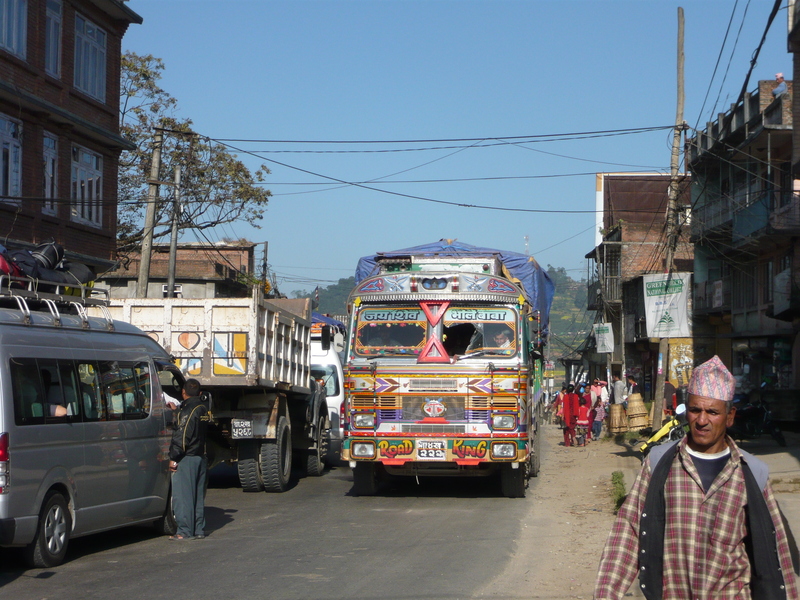 Nepalese buses were always packed to perhaps unsafe levels with people pouring out all three sides of the bus: left, right and on top. Their horns were something else as well with lots of interesting kinds of honks and jingles. I never had the pleasure of riding one of these babies. We were supposed to take one to the start of the Annapurna trek but opted for a driver instead which was well worth the extra money as it took triple the amount of time to get to our destination given the poor quality of the roads (potholes, washed out areas that were never fixed and tons of broken down cars, trucks and buses blocking the two lane “highway”). Travel in a third-world country is always an adventure. I’m curious to see what kind of “buses” I’ll be experiencing in Guatemala. I’ve often heard they are called “chicken buses” and if so, I’m sure there will be plenty of kodak moments on my upcoming travels! Great post, really wish we were there. Me too! Unfortunately it was a year ago now! I am sure I’ll get some great bus pictures in Guatemala! Stay tuned!